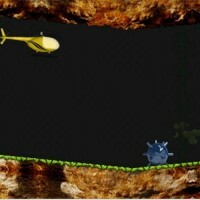 This weekÂ I came across a new game called “Touch Copter” which is a classic cave helicopter game. You are a single helicopter that must dodge the cave walls and obstacles while striving to achieve the most distance/score. Touch Copter is a very simple to learn, fun to play, and enjoyable game right from the start. Its simplicity is its best strength and that makes it highly addictive. However, the App Store is full of copter-style games like Touch Copter, so I decided to downloaded a few of the other copter-style games to see what sets Touch Copter apart from the rest. The immediate notable difference is the game graphics. Touch Copter has expanded graphics from the style that is typically used in the copter-style games. In Touch Copter, you do not get that basic, simple looking geometry common to this style of game. Instead, you get actual cave looking walls, a background with ambient art, and distance flags which help you to visualize your current distance. The visual flags is a feature that I very much enjoy in Touch Copter. The flags are set 100 points apart (distance) so you always have a good idea of how far along you are in the game. Of course, Touch Copter also includes a live score tracker as well, so you need not only rely on the flags for visual cues. Along with great visuals, Touch Copter includes unlockable content that features new helicopter types and new game modes. 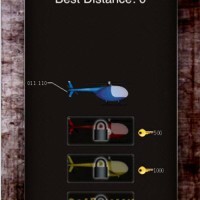 The helicopter types are unlocked as you achieve a specific high score during game play. For example, achieving 500 points unlocks the second helicopter. A new game mode, Gold Rush, is also unlocked by achieving a specific high score. This game mode is something I have not seen in the copter-style games before. 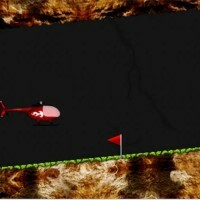 The game mode takes all of the lighting out of the cave and equips the helicopter with a spotlight, which you will use to navigate the cave. The game mode is extremely difficult to play but highly amusing and is most definitely only for the most epic of players among us. 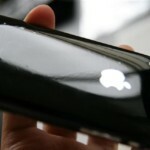 As you play and continue to increase your score, the difficulty of the game progressively increases. You will notice that the helicopter begins to move faster and obstacles begin to become tighter, leaving you to either adapt your game play or crash your helicopter! Once you begin playing, you may notice that something is missing. The one game mechanic that seems to be missing at first is sound. Touch Copter does not include any sounds however it is for good reason. If you can imagine a small helicopter engine sound playing as you are playing and if your game play session happens to be a long one, that sound quickly becomes annoying. So it is for good reason that Touch Copter does not include any sounds, although the developer may be adding a crash sound for the helicopter in the future. But, this does not mean that you cannot have your own sounds! If you are so inclined, you may have your iPod music playing in the background while you play Touch Copter. As many of you know, this is my most favorite feature in games for the iPhone and I will gladly take my own music over any sounds included in a game. Overall, Touch Copter is competitively priced and brings fresh features and innovate game modes to the table that will surely draw in and captivate gamers. Touch Copter delivers highly addictive game play,Â great visuals, flexible content such as unlockables, and the fantastic ability of using your own music during game play. 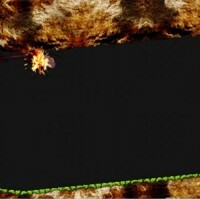 By this, I give Touch Copter a well deserved score of 4.5/5. Touch Copter is available in the iTunes App Store for $0.99. PhantomSkinz 33% OFF July Sale!